The time is nearly here, ClogTwo x Wetworks has called upon a wide range of artist from around the world to present you all with the Shinigami Custom Art Toy Show at FLABSLAB. 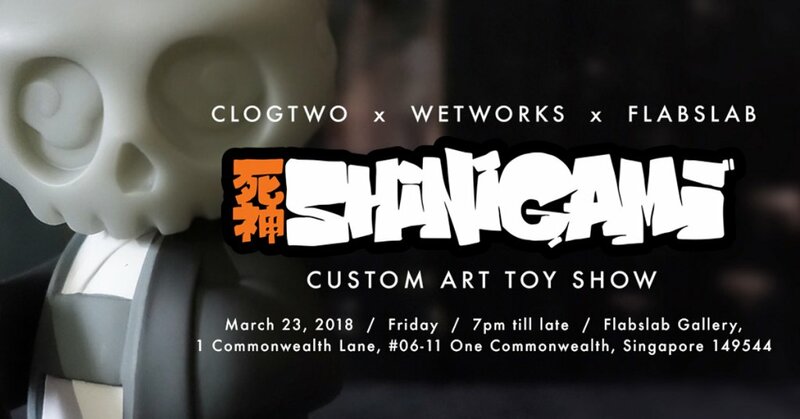 ClogTwo x Wetworks x Pobber has invited the local best graffiti artists, illustrators, customizers, tattoo artist, sofubi masters etc to join in this Custom Art Toy Show using Wetworks x Clogtwo “Shinigami” as canvas platform. But wait there’s more exciting news, in celebration of Wetworks and Clogtwo’s first custom show they have announced a new midnight colorway of “Shinigami” which will be released alongside the custom show.